Plutarch (ca. 46-120 A.D.) - Greek historian who is considered one of the most significant writers of his era. He was born in the Boeotian town of Chearonea to a wealthy Greek family. 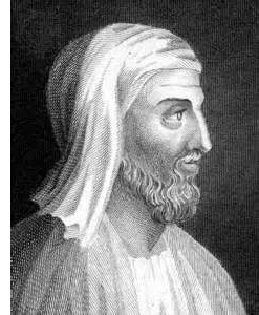 In addition to being a historian, Plutarch studied philosophy and mathematics at the Athens Academy under a teacher named Ammonius. He was regarded as an exceptionally gifted student. As a writer, his specialty was biographies, which is a primary reason why his work is so valuable. Though he lived most of his life in Greece, he traveled extensively throughout the empire, including two trips to Rome. He sought and was granted Roman citizenship and took the name Lucius Mestrius Plutachus. As Chaeronae was only about 20 miles (32 km) east of Delphi, Plutarch also served as a priest of the Oracle for many years. Because of his Greek and Roman affinity, he wrote a very important and interesting work called Parallel Lives, which pairs famous Greeks and Romans together. For example, the most famous pairing is that of Alexander the Great and Julius Caesar. Some others include, Demosthenes and Cicero, as well as Lysander and Sulla. Much of his work survives which makes him a very important source from this era. As a historian, he did not have much use for the "father of history", Herodotus, whom he derisively referred to as the "father of lies".